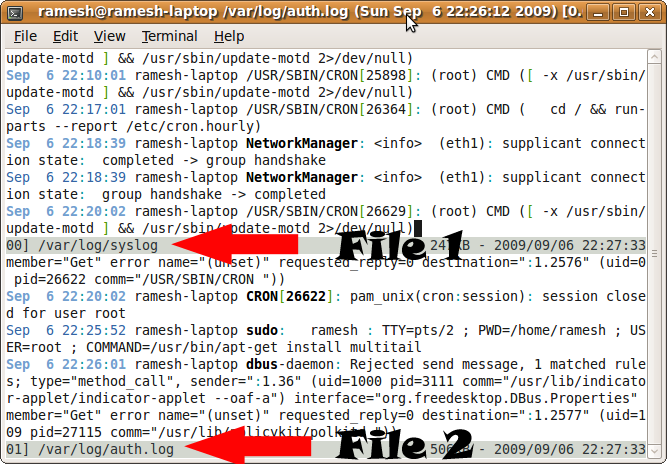 Typically you may open multiple terminals to view tail -f of multiple files as we explained in our previous 10 examples to view unix log files. 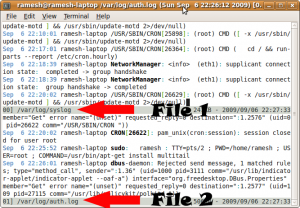 For example, if you want to view Apache error_log and access_log at the same time you may do the following in two different terminals. Wouldn’t it be nice if you can execute multiple unix tail command in single terminal using one of the following methods? In this article let us review using three methods how to execute multiple Linux tail -f at the same time in single terminal. Create the multitail.sh as shown below. Now, open multiple files using this new shell script as shown below. The latest version of the Unix tail command supports multiple -f as shown below. The above will display file name as the first line each time, and then shows the newly grown lines. If you don’t want this to clutter the logs, you can use the next method. Install multitail as shown below. Multitail utility has lot of additional features as explained in the mutitail home page. The output of the second method can be easily customized using grep or sed. Don’t you think `screen’ would work better? Awesome, I wasn’t aware that “multitail” existed until now. there one can see from which file the message comes. Thanks for your feedback about using grep and sed along with tail -f.
Thanks for sharing your tips. Running tail -f in the background may be OK for two files. Anything more than that, it may get little confusing. Thanks for catching the typo. It’s fixed now. Thanks for pointing out the we can view multi files without give -f after each and every file. Tips on how to do this with screen? multi-tail.sh script doesn’t kill tails in the background on my system (debian). In my script below replaces the words “start_date and end_date”. How do I define the dates as replacement patterns? Will appreciate any help. I don’t really understand why you’d script this… my mac and linux machines can follow multiple files simultaneously without any special tricks. Thanks for this post, it was really helpful to me. I have a question on terminating tail -f processes. Normally, when I exit any tail -f command using ctrl +C, it still leaves the process running in background and I have to kill it separately by kill command. Is there any way to exit so that the process associated with this command is also terminated and I don’t have to explicitly kill it? Screen lets you save sessions and log back into them later – no use for monitoring multiple files at the same time in the same window. Did not know about multiple files after the tail -f command, though, so this is very useful! Thanks!